The Diva's challenge this week is to use the two tangles Assunta & Mooka ONLY. It's the first time I've tried either of these & I've been fiddling about with both all week. Assunta came together quite easily but Mooka & I, for some reason, didn't quite gel until I saw Daniele O'Brien's post using her leafy Mooka (a Mooka tangleation). That then became the catalyst for my tile as I realised that Mooka's ends didn't have to be round & it was their roundness that was troubling me. Mooka suddenly opened up for me & I could see Assunta fitting into the leafy ended Mooka very nicely. "That's an onion, or a triffid*......or a triffid masquerading as an onion!" "a monstrous (fictional) stinging plant...."
I hadn't realised this was for the challenge to use just the two tangle patterns until I read the full details and now you've mentioned triffids I can see what your other half (I'm making an assumption here) means now. Strange you had problems with mooka and found assunta easy to do because it was the opposite for me. Mooka still needs lots of practise but I love it - really struggled with assunta when following the 'how to' that I saw so must try again. I really like the leafy ends on your mooka and hadn't thought of that so something else to try. So glad you found Danielle's post and I love how your mooka turned out in this tile! You assunta is sweet.....Very pretty! this is really wonderful Paula, the way you have carried the pattern from the bottom element to the end of the teardrops is a lovely touch. I call them teardrops but really really remind me very stylised floral image, a hint of the fuchsia comes to mind because the droplets are so elegant. Really lovely work and thank you so much sharing. now that's pretty awesome! i love the flower look of your mooka with the little assunta petals dangling down - really creative! 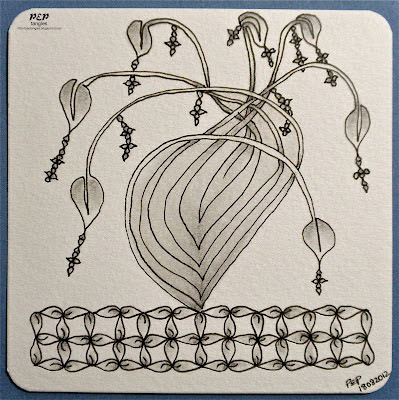 Nicely done Paula, you certainly did the Mooka Leaf tangleation justice. Love the dancing/dangling Assunta's. This is so beautiful Paula, I love the way that one grows from the other and your interpretation of Mooka is just superb,t movement you have achieved looks so flowing. Must check out your link as I struggle to get this to go the way I want as well. Paula you "tangled" these two designs perfectly. I always enjoy sitting and gazing at your detailed patterns. Additionally, you always have thought-provoking insight into your ideas. Mooka is not an easy one that's for sure. I think you did a great job in using the tagleation. Oh, this is so, so beautiful!